1 How long do you want to store it? 10.1 Pouring 5 gallons of gas from a metal can that is a “safety” government approved can take forever and requires some strength and endurance. 16 Where are you on the gas supply chain? 16.2 Prioritize your driving needs. 16.3 Walk or use a bicycle or when you can. Consider a scooter if you live somewhere it is safe to use them. Public transportation is another option if it is still in operation. Gas should be stored in an unattached outbuilding or similar. I know that those of you in apartments may want to risk it but realize the possibility of what can happen. If you rent a house and don’t have a storage building then consider getting one of the smaller plastic based ones like Rubbermaid makes and storing your gas in there. If you move, you can break it down and take it with you. 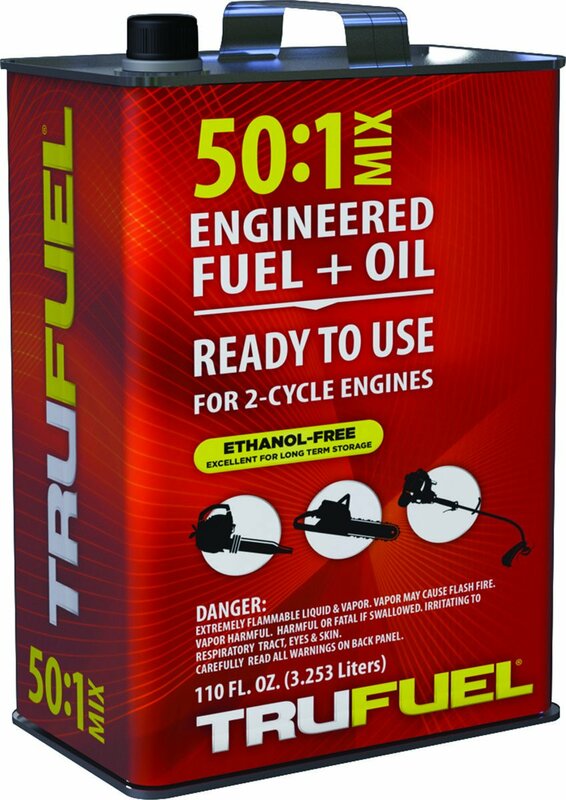 While this stuff sells for $6 per quart and has oil mixed in for use with two-cycle engines, it has an amazing 2-year shelf life after opening. If you keep it sealed this will keep indefinitely. You can get it in bigger containers at Lowes, A 110 fl oz jug is $20 which is a lot for gas but a few of these put back would sure keep your chainsaw running a while, and you would have no worries about finding oil to mix. That could sure help keep your family in firewood for longer during a SHTF scenario or extended emergency. These are great but more expensive than plastic. They can get hot to the touch when left in the sun too. Smaller cans are quite expensive with 5-gallon cans being the most economical. These can be bought at farm supply stores like Tractor Supply or home improvement stores. Be prepared to pay a premium for a metal can but rest assured that if properly cared for they will last practically forever. The spouts on the top can be replaced if something happens, so you don’t have to buy an entire can. 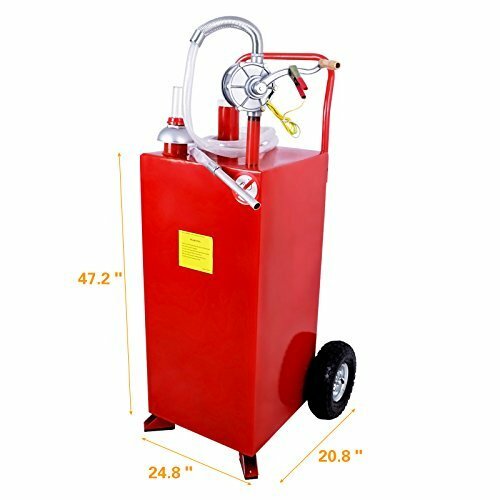 Pouring 5 gallons of gas from a metal can that is a “safety” government approved can take forever and requires some strength and endurance. We have a metal gas can we bought at Tractor Supply, and while it is an ok can, it takes forever to pour into our Kawasaki Mule. This means you are stuck holding gallons of glass for 15 minutes. While I know that many people are not going to be pouring that much at once, it is something that needs to be considered. If you are trying to pour even more into a truck, then be prepared to stand there awhile. I know we are guilty of keeping cans past the time they should be tossed. Check for cracks and make sure to replace spouts that leak or won’t seal enough for safe transport. I hate having to use a grocery bag to stick in a spout. You always get gas on your hands when using a bag and it still evaporates some and will likely leak if it falls over. Replacing spouts might be worth it, but beyond that, you are going just to want to throw out an old can and get a new one. These are the most common kind of gas can, and they get the job done. We use plastic cans a lot for mixing a few gallons of weedeater gas at a time. Since getting our metal cans, we usually don’t use plastic for transporting gas from the station to our farm. There is nothing wrong with plastic cans. Metal offers more strength and puncture resistance and doesn’t break down as badly when exposed to a lot of sun. I live in the South, and we use our cans out in the field a lot so over a few years you can see that plastic starting to turn. I like the one-gallon size if I find myself carrying gas around the place with no transportation. In the dead of winter, we do not go through near as much mixed gas so we do not want to mix more than a gallon at a time or it will just sit for a month at a time. 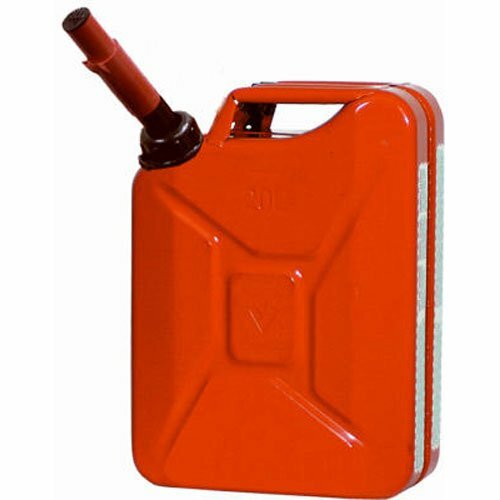 After using whatever gas cans are sold at Lowes or the gas station, I am intrigued by the one shown below. I have to admit that the cans I have used have a tendency to lose their caps or get a bit leaky. One cannot help but notice a large number of bad reviews for these cans. The one shown below is the exception. Although it is a bit over $20, it gets the best feedback I could find for a small can. I love that you can easily see the volume level so you always know exactly what you have on hand. I didn’t know about these until I started researching this article. I like the idea of gas on wheels because it eliminates the issue of having to lift and struggle as much with stored gas. You have to use a battery to power the pump or some electricity unless you want to hand pump or siphon but this setup stores more gas for less than the equivalent in cans would cost. It is important to realize just how much gas you would need to get through a specific period. I am going to use our truck’s gas consumption as an example as well as our needs. There are very few trips to town compared to the average home because we work at home and plan trips out for efficiency and we don’t have any extra social activities or obligations in town either. Our 2009 Toyota Tacoma has four-wheel drive and gets about 20 miles to the gallon on the highway. The tank is about 20 gallons, so we have a range in the 350-400 mile range on a single fill up. We fill up 1-2 times per month depending on what we are up to and any visits to family. One fill up a month is more realistic most of the time because we use the Kawasaki Mule for a lot of run around on our property or to care for my father down the road. The Mule adds another 10 gallons to the gas budget. I believe with a little planning we could probably make it on 20 gallons per month between the machines we had, but that means if we wanted to have even six months worth of gas on hand for our personal and farm needs, we would need 120 gallons of gas stored! Now imagine what that figure would be for those that don’t live 4 miles from town, have to commute daily, have less fuel-efficient vehicles, etc. My point is that unless you have a big buried gas tank and pump on your property it is highly unlikely that you are going to be able to store enough fuel to get by for more than a few months and even that is going to be a challenge. Some fuel is a good idea and will help you get through a slight shortage, but you have to be realistic. Where are you on the gas supply chain? There is nothing like a real gas shortage to show you just where you land on the supply chain. The mountains of western North Carolina are at the very end of the supply chain. We get gas last. This means if a hurricane comes through and destroys a refinery or damages a pipeline and supply drops we get left out. This has happened several times in the last few years. The worst was about two years ago. A lot of people tried to blame the shortage on people topping off tanks and hoarding. These same people blamed the local news station for causing a crisis. All they did was the report on the refinery explosion and when gas stations started running low. It was ridiculous how people were in such denial that our fuel supplies are so thin and vulnerable. While you saw people filling up there vehicles and maybe a 5 gallon can for back up; it was clear that there really was a shortage. Stations simply were not getting deliveries because we are the last on deliveries. It showed just how reliant an area is on those regular deliveries. During a shortage or complete lack of gasoline, you will need to take steps to reduce your consumption so you can get the most use out of what you have on hand. I don’t recommend trusting news sources when it comes to predicting the end of a major shortage. Sometimes news sources try to keep down panic, or they are fed information that is intended to be reassuring rather than give the reality of the situation to the public. Here are some ways to reduce your gas consumption. Some of these you may want to implement in good times to save time and money while others are just to be utilized under extreme circumstances. Plan and combine trips for supplies and work. Consider carpooling with neighbors or friends, so everyone burns less gas. It is amazing to me how many people make 2 or more trips to town when one will do. Planning out your route can also save time and gas. Make a list and do your shopping on the way home from work if you can still do your job during a gas crisis. Trips to the grocery store can take a lot of gas if you live outside of town. A trip to the grocery store once a week is adequate for most households if planned right. Have enough food. beverage, and medications on hand so that you could stay at home for a few weeks if necessary. Having preps put back is a good way to ride out a gas shortage. While I know a lot of people are still going to need to go into work to make a living, there may be some people that find that the gas or diesel is not there for them to do their jobs. During a gas shortage, the chances of civil unrest rise dramatically so you may want to avoid being out in some areas. Some folks get a little crazy when they have to stay at home or in one place for very long. Then there are those that have a lot of extracurricular activities to shuttle their kids to. I suggest considering prioritizing your gas needs. Everything else comes in after these. Really in a major gas situation, you should consider eliminating any social or sports obligations or at least carpool with others. Walk or use a bicycle or when you can. Consider a scooter if you live somewhere it is safe to use them. Public transportation is another option if it is still in operation. If you live close enough to stores or your work to use other methods of transportation that use little or no gas then consider it. A used scooter can be purchased for little, and you could keep it on hand for saving gas when you want a quick trip to the store. Scooters are not allowed on fast highways like interstates, but for getting around town or riding back roads, they would be better than nothing. Reduce the urge to get out by having some entertainment options or hobbies you can do at home. Those with kids I’m sure to know all too well how bored kids can get. A tote putback with fun activities in it is an excellent prep for a variety of situations. Remember to have some backup chargers or batteries for electronic devices. Ereaders are always going to have a longer lasting battery than a tablet, so they are something to consider. A used Kindle costs very little, and you can read for over 20 hours on a single charge. Have you got any tips for storing gas or getting through a shortage? Any stories to tell about when you had to deal with little or no gas? Please share with us in the comments below. Very good article on a little understood subject. Consider 30 to 55 gal drums. Make or buy a cart to move it around. Make sure it is sealed – sniff test at the openings. Get a bung wrench and valve / hand pump to dispense and it should keep for years . Rotate the stock at least annualy. Date the cans and mark the level. Sniff test on the caps. I use plastic grocery sacks as an additional seal under the screw cap. Snap caps are rearly secure. As old as most of my plastic cans are most will leak a little in a hor shop. I get a gas discount on 35 gallons a month from the grocery store and monthly load around 50 to 75 gallons worth of plastic cans on the trailer and fill up. I use the cans to fill the motorcycle, which is my primary commuting vehicle. Also, I can treat my wife to a full tank in bad weather or if her travels are away from a gas station. I always like to have enough gas on hand to fill the empty tanks on the cars and a tank full to carry to get us some where else if the stay put plan is not best for the situation. As far as complaints that “hoarders” cause the shortages, well, if the price is not allowed to rise when the supply gets short, there by rationing a scarce good by price, folks are well advised to stock up. If you HAD to have ice to keep, say insulin cold, would you want to have it avaliable at $100 a sack, or be told the last guy put the last 5 sacks in a cooler to keep his beer cold? On that note, get a few cases of canned air if you do need to keep insulin cold. If you discharge a can upside down you can cool things down as the liquid flashes to vapor. Better to live stocked up! These gov required safety cans, are like everything the gov gives a name to. Exactly opposite of what it does. 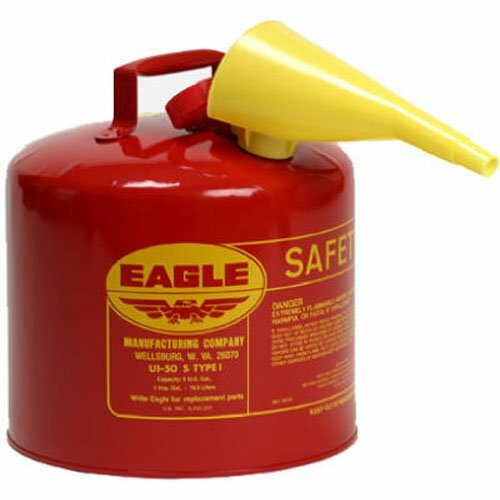 The safety cans I have are so hard to handle and get the gas going, then keep it going, that gas ends up spilling everywhere. Not safe on a hot lawn tractor engine. Alcohol can be a gas too. Most modern cars can be run on 50% alcohol without any problems. Methanol, Wood alcohol doesn’t even need a permit. Look for a book “Alcohol can be a gas”. Yep, another nice thing about living 14 miles from an ethanol plant that I’m an investor. I have a Ford Focus that is flex fuel and can run on 85% ethanol (E85). Right now E85 is about 70 cents a gallon less than E10 and $1 less than the E0 pure gasoline that I could use. In a pinch it would run okay on 100% ethanol. I get 30 mpg on E85 at interstate speeds. 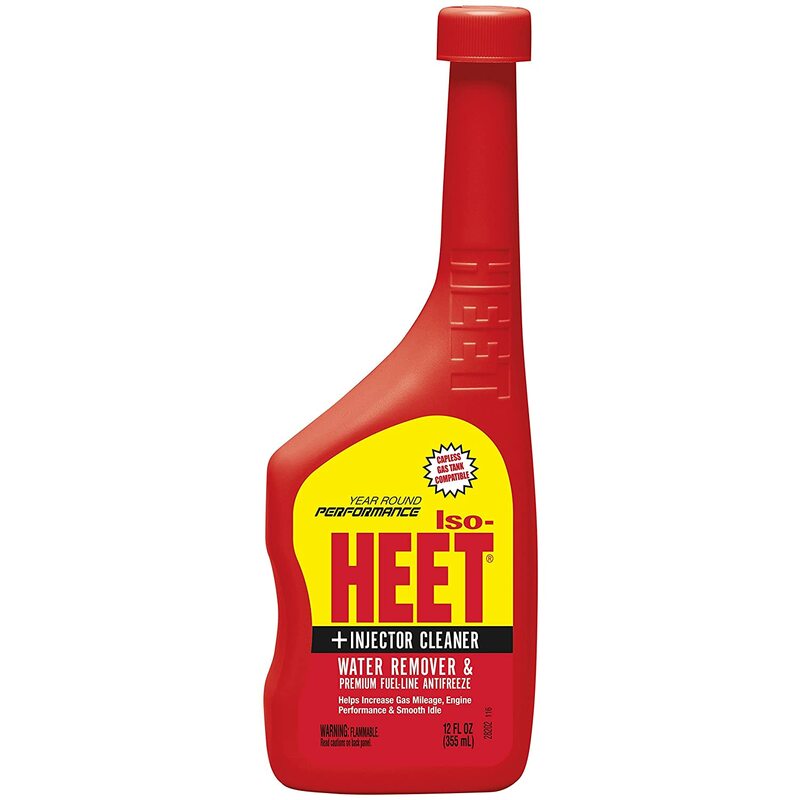 Another thing with 10% ethanol fuel, you don’t need Heet since it is alcohol too. 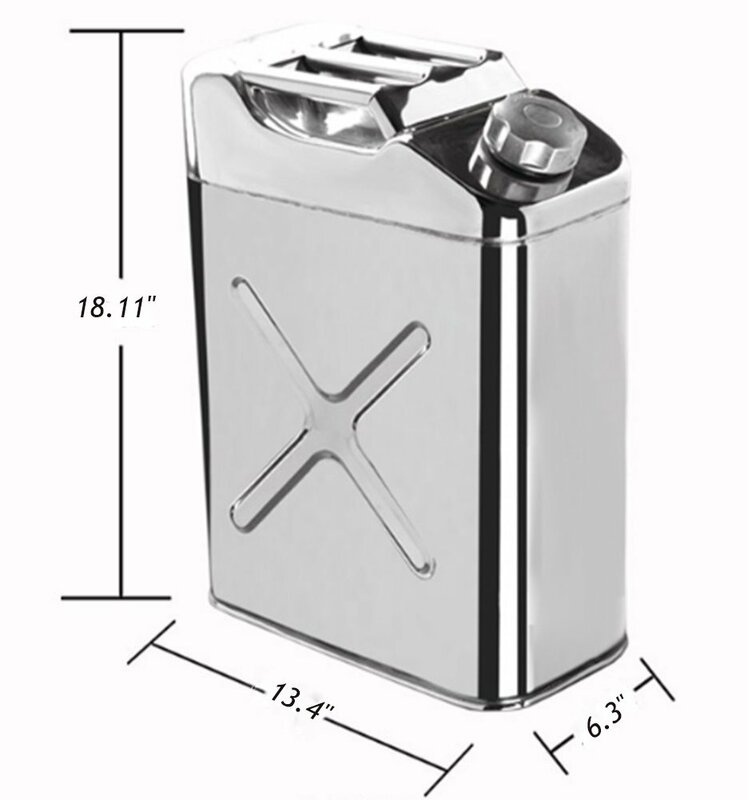 Stock-up in butane lighter refill canisters too. A little advertised fact about gasoline is that the refiners put as much butane into the mix as they can get away with. Summer blends may only be 2% with around 10% in winter blends. “Stale” gasoline has lost the butane. And butane makes for easy starting. You can add some butane to your stale gasoline with the lighter refills in a pinch. Once the engine is started, it’ll run on stale gas. It just won’t start. Keep a fire extinguisher handy and know how to use it! Use metal only please! Plastic is unsafe and nature suffers from it. The gasoline additive “Sea Foam” is a fuel stabilizer that can preserve gas for two years. One ounce per gallon is sufficient. One can will stabilize 20 gallons of fuel. 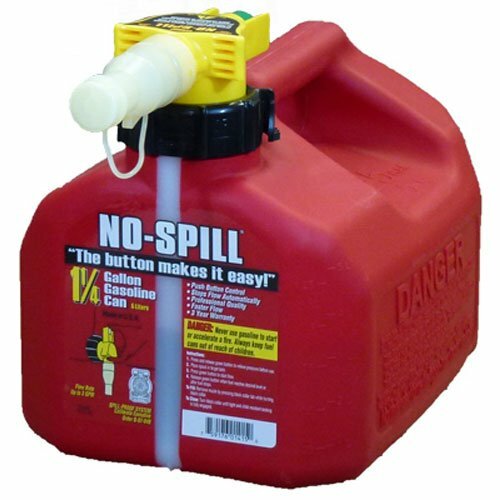 As anyone who has attempted to use the new “government approved” gas cans knows, the “no spill” filler spouts are totally useless and spill more gas than the old type ever did. A simple solution is to replace the spouts with newly manufactured spouts that are of the old, more use-able and reliable design. I found them from an Ebay seller called Gas Spouts Plus, LLC. I have no dog in the fight other than I’ve used their replacement spouts and have been very happy with the product. I haven’t ordered from them in a couple of years so I hope they’re still in operation.